810 Grant McConachie Squadron has molded hundreds of youth over the last 46 years into leaders of the future. Cadets will explore aviation, survival, instruction, leadership, marksmanship and many other skills throughout their time with the cadet program. Events, training information, and more happening this week. Details on how and when to contact the squadron. Riverbend Gardens Fundraiser is Live! Click Here for Info. We're excited to announce a new fundraiser for the squadron: The Riverbend Gardens CSA Fundraiser! Community Supported Agriculture is when families pre-purchase a set number of weeks of fresh produce from a farm in their local area. In the case of Riverbend Gardens, the CSA is 15 weeks long starting in early July and offers unbelieveably fresh, high-quality, and locally grown produce for your family, starting as low as $23 per week. Sign-up is now open. We encourage cadet families to purchase the CSA and to offer it to extended family, co-workers, and neighbours. Riverbend Gardens will be donating 15% of all sales made by cadets back to the squadron! A new year means new Bingo committments for all of our cadet families. The first dates for the training year are out and still in need of sign-ups. There will be more dates into 2019 but we encourage you to get some of your bingos out of the way early. 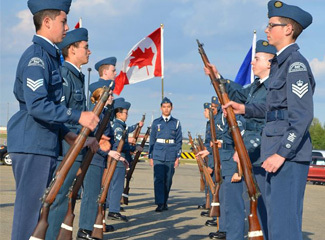 Learn more about 810 Air Cadet Squadron and the Royal Canadian Air Cadets, the programs we offer, and how you can get your child involved. The key way for the squadron to provide up-to-date information regarding training, events, and other program information is through our email list. If you have an active cadet (or are thinking about enrolling your child), you should be signed up to this list. Check here often for updated information on cadet activities. Cadets can only sign up for one weekend. Permission Slips are due April 10, 2019 by 2030hrs. DRESS: Civilian Clothing, with jacket and hat. OTHER: Cadets should bring the required items as per the FTX kit list above. 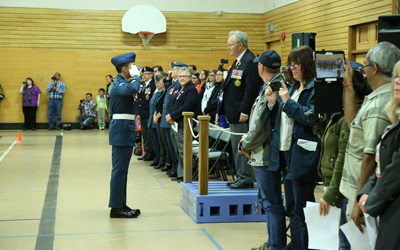 For over 46 years, 810 Grant McConachie Squadron has molded hundred of Alberta youth into the leaders of the future. Cadet training explores aviation, survival, instruction, leadership, marksmanship, and many other skills. Children between the ages of 12 and 18 are eligible for the program and mandatory training is on Wednesday evenings at Kenilworth School in Edmonton.